You Can Never Run Out of Love is a children’s picture book written by Helen Docherty, illustrated by Ali Pye and published by Simon and Schuster. RRP: $Au 14.99 PB. You can’t measure love in a bucket or cup. You don’t have to worry you’ll use it all up. Because love’s not a game where you have to keep score. Whenever you give some, you’ll always have more. When you’ve run out of everything else you’ll still find . . .
It’s lovely to find a children’s picture book that points out to kids something we adults tend to take for granted: despite being able to “run out” of all sorts of things, we don’t ever run out of love. Docherty doesn’t preach, and that underlying message is always light-hearted. The text is rhythmic and rhyming, with the title used as a refrain for kids to join in. 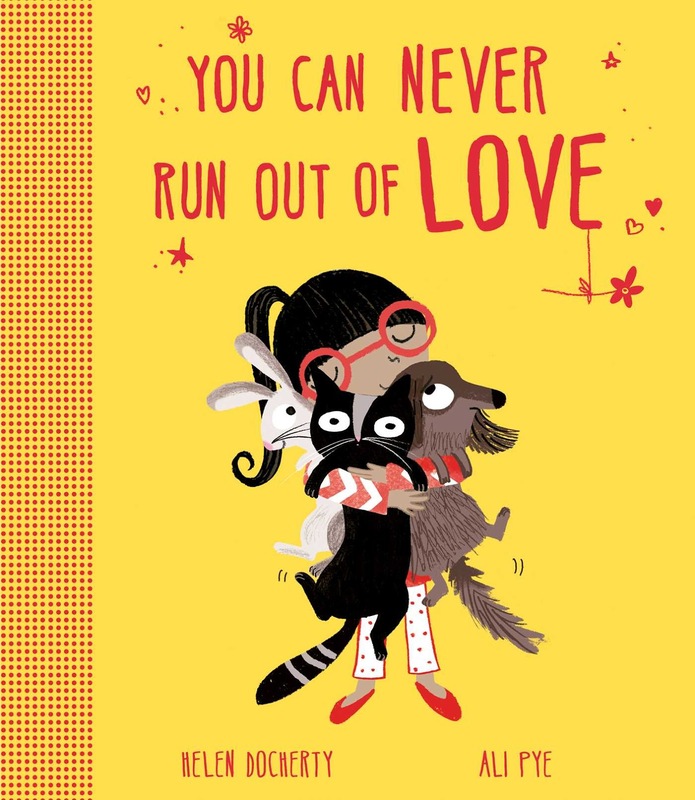 The cover of You Can Never Run Out of Love is a strong sunshiny yellow, and features a smiling girl with an armful of pets. I predict kids will grin back and reach for the book, and I know they will enjoy all the humour inside! Author and illustrator work together to show us all the things we CAN run out of, and hint at why. “You can run out of chocolates..” is accompanied by a smeary-faced toddler inside the chocolate box, licking her fingers. Not all the situations are dire though - running out of socks just means an enormous pile of them provides a look-out place for a young adventurer and his telescope. Pye’s illustrations are lovely. Characters’ faces are so expressive, and she has added an immediacy and imperfection by using textures from mono prints. There are many details that will reward young readers’ close scrutiny. I loved the simple palette of reds and blues, complemented by aqua, yellow and pink. You Can Never Run Out of Love would make an excellent book to use when helping kids develop the skill of inferring. Also, because it’s in rhyme, I think classes might like to become so familiar with the text that they can recite it to their parents. I’ll be adding this picture book to my List of Picture Books with Strong Rhyme and Rhythm. I hope you will share it with the kids you know very soon!